Orange County officially kicked off the holiday season on Thursday night at the Orange County Regional History Center with its signature Holiday at Heritage Square celebration. Now in its 12th year, this free family event has become a tradition for many families and was created by Orange County Government for local children and their families to ring-in the holiday season together and light up the heart of downtown Orlando. Mayor Teresa Jacobs flipped the switch to light up Heritage Square following a countdown with emcee and FOX 35 WOFL Entertainment Reporter David Martin. This year’s annual holiday celebration included musical performances by Faith Assembly Church Choir, Clare and the Chocolate Nutcracker, the Grand Avenue Elementary School Choir, and Hillcrest Elementary School. Hundreds of children assembled various holiday crafts with their families and History Center staff. In addition to decorating gingerbread men cookies, visitors enjoyed milk, egg nog and hot apple cider. Families also visited with a very special guest all the way from the North Pole – Santa Claus! In addition to Santa, special participants entertained the revelers, including Kingston, the mascot from Orlando City Soccer Club; Princess Frost and Princess Evergreen; Scooter the mascot from Orange County Parks and Recreation; Squirt, the mascot from the Orange County Library; and Victorian characters from the Dr. Phillips High School Theatre Magnet program. Families attending the lighting ceremony took to heart the season of giving and Orange County’s “neighbors helping neighbors” philosophy. Many guests brought a new, unwrapped toy for Mayor Jacobs’ 2014 Holiday Heroes Toy Drive. Orange County employees have collected hundreds of toys that will be distributed to children up to age 18 through Wraparound Orange, the Orange County Neighborhood Centers for Families, Orange County Public Schools’ Homeless Program and the Community Food and Outreach Center. Mayor Jacobs thanked all the holiday helpers and heroes, and the History Center, one of the crown jewels of downtown Orlando. Visitors may come back to the Orange County Regional History Center to view some upcoming exciting exhibits. From Jan. 15 through March 22, The Art of the Highwaymen will feature the stunning landscapes and rags-to-riches stories of Floridians in the ‘50s and ‘60s. Additionally, the traveling exhibit “And Still We Rise: Race, Culture and Visual Conversations,” which narrates four centuries of African-American culture through 69 story quilts from 60 artists, will be on display from February 7 through May 3. 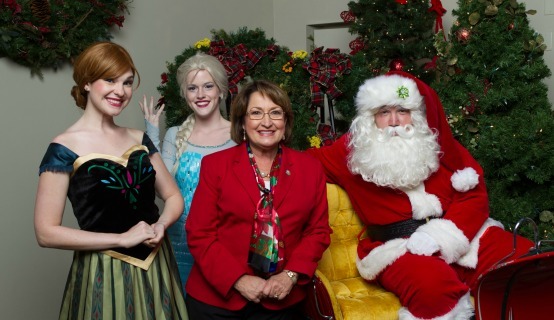 A collection of photos from the 2014 Holiday at Heritage Square celebration and a collection of Family Photos with Santa from Holiday at Heritage Square are available on Flickr for use by the media.